Employee Morale: Driving Performance in Challenging Times by David Bowles and Cary Cooper. David and Cary created a well-written and well thought out book on employee morale and the links between morale and performance. 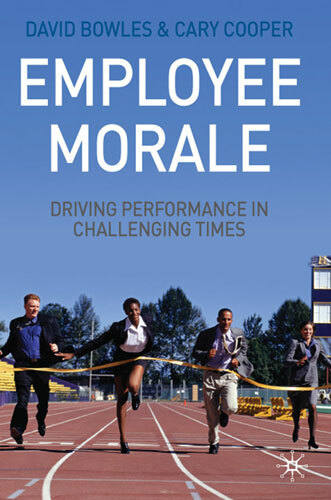 The biggest benefit of morale is individual and organizational performance and the authors present the evidence for “morale correlating highly with, and driving, performance is strong and growing” (p.59). Morale can empower of disable the organization’s ability to achieve its goals. Its Monday morning in Beijing, London or Sydney; do you really know how your employees there are doing? From whom did you learn it? Do those from whom you learned it represent the whole organization? When did you least find out? Could there have been a shift since then? What are the consequences if what you think is true, is not? Management upgrade. The most practical chapter was chapter 5 on creating/maintaining the high morale organization. We can manage morale and the strongest effect on morale is a “management upgrade.” The authors offer a number of perspective and suggestions around strengthening morale through strengthening management. I recommend the book and it would make a great textbook for a university course or Morale and Organizational Behavior.